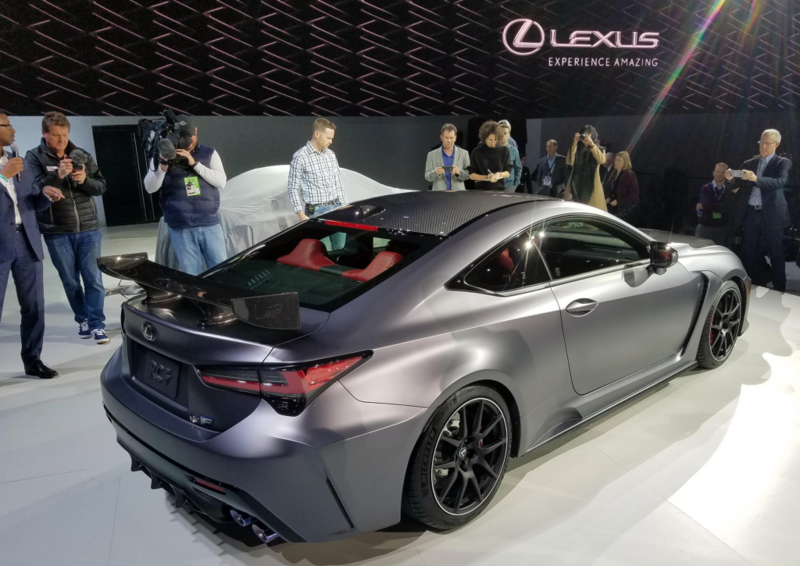 DETROIT—Lexus’s sporty RC coupe lineup launched for the 2015 model year, so it’s old enough now to have reached its “freshen by” date. The RC 300 and RC 350 models got a refresh for the 2019 model year that included updated styling, retuned suspension, and a few newly available features. For 2020, it’s the high-performance RC F model’s turn. 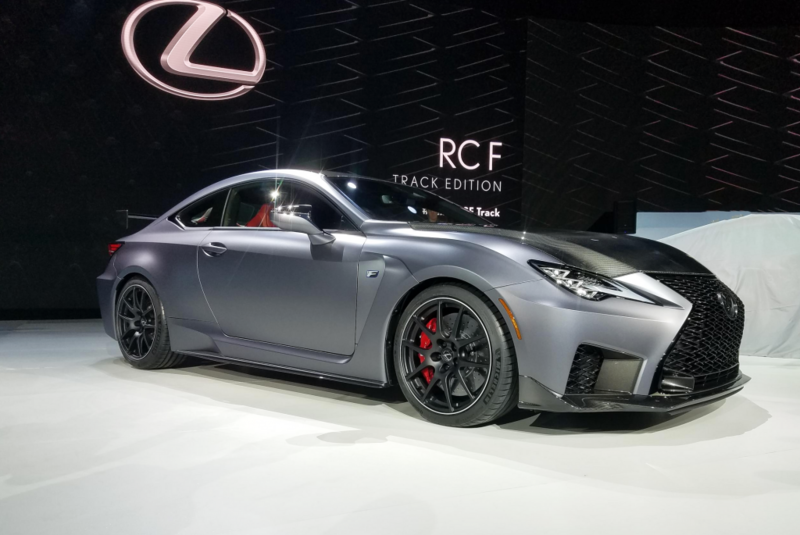 At the 2019 North American International Auto Show in Detroit, Lexus unveiled the 2020 RC F and the new RC F Track Edition model. Subtle styling changes adorn the 2020 RC F’s exterior. Updated headlights have stacked LED lighting elements and integrated daytime running lights. The front grille shape is slightly altered via a lower lip opening that stretches across the bottom. New taillights and a reshaped bumper bring up the rear. Lexus has taken several measures to reduce weight on the 2020 RC F, including a pared-down intake manifold, smaller air-conditioning compressor, a switch to aluminum on some suspension components, and hollow half shafts in place of solid shafts in the rear end. 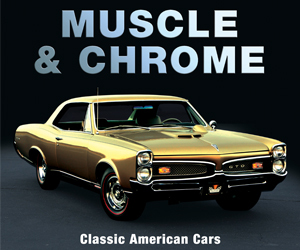 Other chassis revisions include stiffer bushings for the rear suspension arms and steering rack mounts, as well as more-rigid engine mounts. Also new are Michelin Pilot Sport 4S tires designed specifically for the RC F.
The 5.0-liter V8 gets a slight boost in horsepower and torque—from 467 to 472 hp, and from 389 to 395 pound feet—thanks to a revised intake routing and a lower-rpm trigger point for the secondary intake opening. The 8-speed automatic transmission is mostly carried over, but a higher final drive ratio (3.13 in place of 2.93) will make the RC F feel snappier from a stop. Speaking of snappier from a stop, electronic launch control is a new standard feature. The system automatically modulates the traction and throttle control, so all the driver needs to do is press and hold the brake, press a console button to activate the system, floor the throttle pedal, and release the brake. Lexus says the launch control feature enables a 0-60-mph time of 4.2 seconds for the “regular” RC F, and a mere 3.96 seconds for the new Track Edition. The Track Edition is a limited-production model that gets a number of track-focused enhancements, such as a carbon-fiber front spoiler, a fixed carbon-fiber rear wing (in place of the active rear spoiler of other RC Fs), titanium muffler and tailpipes, Brembo-brand carbon ceramic brake rotors, and lightweight 19-inch BBS forged wheels. The last two items on that list account for a 55-pound reduction in unsprung weight on the front of the car, according to Lexus. Carbon fiber is also utilized for the hood, roof, and partition behind the rear seats; in all, Lexus’s estimates put the total weight reduction at 176 pounds compared to the previous RC F.
The Track Edition comes standard with a red leather interior and will be available only just two exterior colors: Ultra White and Matte Nebula Grey, the latter a Track Edition exclusive. 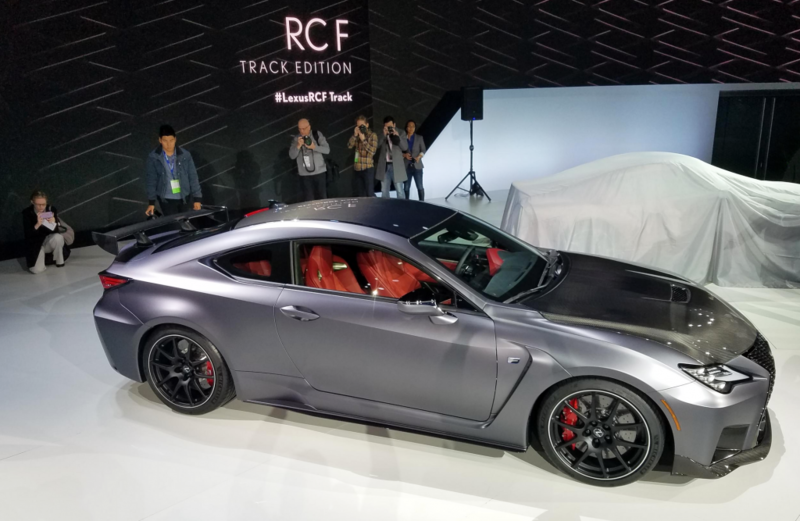 The 2020 Lexus RC F and RC F Track Edition should begin arriving in dealerships by summer 2019. Pricing will be released closer to their on-sale dates. The Lexus RC F occupies a compelling little niche in the luxury-brand sporty/performance coupe category; it offers especially brawny V8 power with a luxurious cabin and a fine roster of available upscale features. 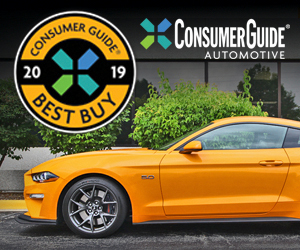 It’s also more affordable than many of its European-brand rivals. The fine tuning for 2020 will help keep the RC F fresh, and the new Track Edition model—one of the most overtly performance-styled vehicles Lexus has ever offered—provides an interesting alternative to the “above and beyond” performance models from BMW, Jaguar, and Mercedes-Benz. Written by: Damon Bell on January 16, 2019.